I have learnt that I need to think out-of-the-box and remove preconceived expectations. I should always ask myself what the possibilities are, and view them from different perspectives. Once the expectation has been taken out from my mind, then I will be able to think more creatively; and hence, come out with more innovative product or solutions. The programme also introduced us to the ‘SCAMPER’ tool. For me as a leader, the SCAMPER tool is very useful in helping me to be more creative and innovative in delivering my breakthrough output. The Multiple Intelligence (MI) theory by Prof. Howard Gardner and the MI assessment questionnaires really revealed who we are in terms of how our brains operate in order to discover our potential as human beings. My assessment result showed that I fall under the MUSICAL intelligence type category, which I agree. I am the type of person who loves music and always finds time to listen to music. I always get better ideas when I listen to music. 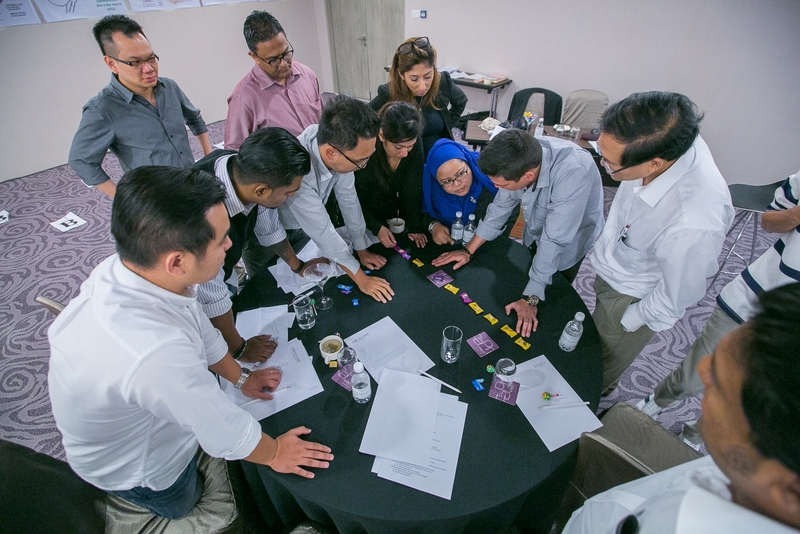 Invictus Leader’s programmes are different from others where instead of using a lot of materials, Ravi uses interactivity, active probing and assessments that are really effective to open up our minds to think out-of-the-box. For me, I will always want to know more and more. As a start, I am learning not to set the expectations but rather POSSIBILITIES. THINK first and then you BEHAVE. The programme has set me in the right direction on how to think more innovatively in manage my personal skills. It’s all about the journey, and I am ready to learn more and more to become a better LEADER in the near future. The evaluation I got from the assessment helped me to understand myself better. I would say the outcome from the assessment was quite close to what I was actually practising, be it at work or at home. During the programme, whenever Mr Ravi pointed out our behaviours, it often got me thinking. I always believe that if a person behaves and thinks negatively, the negative aura will stick with them throughout their lives, and Lady Luck will probably shy away from such people. During the programme, I encountered some participants who were cynical about the objectives of the programme and I could not understand why they would think such a way. I always keep in mind this particular sentence from Mr Ravi, “If the person chooses to hate or hold grudges against me and if it doesn’t add value to me, I shouldn’t be bothered by it”. I kept reminding myself of this throughout the whole week. It helped me work objectively without putting my personal feelings in it. Now I am starting to do a self-check (my current feelings and state of emotions) before I start my conversation with others or when someone tells me something, I start to listen instead of judging them. I was inspired by Mr Ravi’s stories especially about how he had been talking to the farmer who never went to school. I enjoyed my assessment session with Mr Ravi…I remember every single piece of advice he has told me and I really appreciate it! I would like to express my deepest appreciation to Mr Ravi for being a thinker and for his guidance on my understanding of self-progression. In this programme, I learnt the importance of “emotional” control and to be “neutral” in looking at each scenario. Controlling and looking at myself every night through meditation and chanting has been really effective. An emotional “let go” is really crucial to everyone, but self-esteem often gets in the way… To be perfectly and characteristically neutralized is really crucial to me and my future success – I’m still working hard towards it. Again, thanks to Mr Ravi for his kindness and effort in guiding me to remove my own filters and to be able to think that every aspect is possible. Positive thinking does make one a better success and I truly believe that I will able to reach this level. Overall the programme was interesting yet mentally draining. The facilitator, Ravi, gave most of us surprises and he let us guess what his next move would be. We had to think a lot to follow through and it activated our thinking mode. The programme has successfully taught me not to judge a person, and to constantly question things. After attending the first day of the programme, I was actually looking forward to the next day. During the programme, I was very conscious of how Ravi analyzed/read all the participants’ behaviour through their body language. It was obvious, and it resulted in some of my colleagues putting on a protective armour to prevent themselves from being understood by him. Ravi, I must say, is a great co-coordinator in leadership programmes. The course materials, as always, were being displayed on the walls; they were attractive and illustrative. The best part was that we were asked to move around to read them. Besides, there were video presentations, games, etc catering for people with different learning orientations (visual, auditory, kinesthetic, sensory etc). The programme was very “packed” and well-structured and the people could not have any chance of dozing off in class. The post-activity discussions were interesting; there were many brilliant points raised concerning innovations. I have learnt to see things in other perspectives, for example, an aeroplane does not necessarily have wings. In summary, I am “evolving” in my leadership journey. I may not be there yet, but I believe I could become a better person in life and a better leader at work – “emptying” myself in order to embrace better ingredients in life, for sustainable performance. First of all, thank you, Ravi, for showing me the door towards more possibilities. The session with Ravi served like a reminder as well as a mental boost towards self-awareness. The fact that I had a long leave before this helped a lot, too. To me, and especially during these 2 weeks, I have been able to experience things that could have never happened before. I look and communicate with people more differently and I find the rewards are so fruitful. I admit, sometimes our minds will still start to wander. But once we bring them back to the “right” track, we will be smiling to ourselves again. Start thinking instead of behaving. Yup, never say never! In short, I learnt something out of it. I found the course enlightening in that it showed me possibilities. In life, we are very used to limitations and “filters”. And sometimes we KNOW that everything is a choice, and it’s up to us to make the choice we know we need, but a programme like this opens up your mind to what you can achieve if you let go of your filters. I felt that this course, while only giving me one tool – the Scamper model – to innovate, ultimately showed me that I don’t need models to innovate if I just opened my mind a little. The course content was great. It was very interactive with a combination of knowledge sharing, charts, examples, videos, assessments and games. Mr Ravi knew how to keep the crowd awake and sustain our interest. I remember what he said – when you think a crowd is disengaging, try talking about something mysterious. There was a lot of knowledge to be gained, and I will try to remember all of them. The best kinds of facilitators are able to gauge the level of interest in a room and adapt their presentation throughout. Mr Ravi knew each of us within a few minutes and he was able to tailor his facilitation to suit each of us in return, and that is the best kind of facilitator for a programme which needs to re-wire us. He also gave us the opportunity for a one-to-one session with him, and I value straightforward feedback (the truth will hurt sometimes, but if it shows me what I need to improve on, then so be it). The course material was awesome. I have always believed that we don’t need a stack of papers on our table for each training programme we go for, as having papers in front of you will detract you from the speaker/facilitator/presenter. In this way, we were able to focus on the speaker and what was being delivered. I found that the facilitator is very knowledgeable on the subject matter. He could quote many real life instances and examples to illustrate his points. Visual media were presented to facilitate learning. Besides, he was following our progress closely to see how he could best tweak and formulate his strategies towards driving home the course objectives. Not an easy task, given the diverse background of the participants. The facilitator made sure that everyone participated in the discussion sessions and activities. Time was well managed. …a leader not only needs to innovate in coming out with solutions, he/she needs to also innovate in communicating his/her innovations depending on the filters/walls that has been erected by his counter-parties. Entropy exists in all states of entities. Over time, any entity that does not innovate to change/evolve their current forms will simply decay and becomes insignificant. This is true for me and also true for any business entity. Those that change rapidly will be ahead of those that remain static. The course has been for me, a spark which helps to start a fire. Nothing can be thought in 2 days, nay even 100 days, if there is no aspiration to change. The fuel of course, as we have been reminded by Ravi, is in ourselves. This programme requires us to let go of filters and step out of our comfort zone to effectively learn, not only from the training but also from each other. I am thankful to be in a group with a high level of openness and sincerity in sharing. · In my effort to adapt and blend in with the culture and environment of the organization, I have consciously and unconsciously put on numerous filters. As a result, I am overly cautious about what and how I express myself. I will now be mindful to just be myself and not let the environment close-in on me. · I have always set expectations on myself and others in all situations as a way of ensuring the output. Now I’ve realized that setting expectations also limits the output because I stopped at a certain level and have forgotten to look at unlimited possibilities. · Acting like a leader and thinking like a leader are two very different things. By thinking like a leader, I will learn to ask the correct questions that will help enrich my learning and experience. · At first, a slight frustration because I was ‘expecting’ to be guided on how to unleash innovation skills. · I was reminded after the ‘scolding’ on the morning of 2nd day to retune my mindset and let go of the ‘expectations’ to fully gain from this programme. · A growing level of anxiety as I did a quick review on my intrapersonal skills and realized there were many gaps. To be an effective leader, I first need to fix myself. · Highly observant and a mentalist.  Taking away the “filters” which often come naturally in my subconscious. All the above will require time to adapt and change. The only way is to continue practising it and always be aware of our emotions. This training is the most different type of training that I’ve been to. The concept of training that is so different, with no module or name tag but with a free-flow schedule, really opened my mind to self-management. If you want more, you need to work harder. You want notes, you need to write it down, or you feel cold? You need to find a solution on how to increase temperature or turn off the air conditioner. This really made me become more than who I used to be. I took some time to accept the things the facilitator had said about me; I couldn’t really concentrate at the beginning because I was a bit mad with his words, but after some time I tried to accept that maybe he was right, so I tried to take out all the filter on the second day, come in fresh and think positive, and I became more brave and really enjoyed learning on the second day. The key is just to think positive, come with an open mind and accept all the possibilities. Now I think I have changed bit by bit. Even when I go home, I share all the learning tips to my families, like a trainer at home. My mother-in-law is my biggest fan; she likes me to share all the learning, so she that she, too, can change to become a better person (even though she is already 60 years old, she still wants to change). Self-discovery could be a pain. It’s never easy to chew on the revelation that I’m bossy or a control freak. I was partly disheartened at the end of the workshop after finding out about these negative traits I’ve developed. Sometimes we need to be broken down in order to progress in life. This is what the workshop does. It challenges us, it points out our weaknesses, and it tells us we’re wrong. I told myself that I cannot dwell in my feelings of defeat, but make the best out of it. In the past one week, I’ve consciously toned down on my expectations towards colleagues and do my best to be more patient in helping them. I know I have filters. In fact, everyone has filters! What’s most dangerous is when a person imposes his/her filters on others, and a control freak would most likely go to that level. When this happens, it kills innovation and kills the environment that fosters innovation. This is what I will potentially do if I continue with my current mindset. You told us that to change the output, we must change the input. I am really in a dire need to put my brain in a washing machine with maximum whirling. This will require some time as I can’t remove overnight the filters which have been planted in me for the past 24 years. To begin, I need to be more conscious in my daily life. I realize that it’s very easy to put my life gear in an auto-cruise mode and do things based on what I usually do, which, I hate to admit, does not differentiate me from a robot. What I’m certain is that at the end of the day, I want to grow to motivate others and be a leader, not just a manager or a controller. I would rate the programme as “good”. I would like to say that the rewiring of innovation within myself has helped me realize my mindset and thinking. This is a good thing as one of the steps to change in leadership is first, understanding how we think or behave. For things to change, I must change first. The reason why I rate the programme “good” and not “very good” is because I have yet to fully practise all that I have learnt. When that time comes it will be “very good” (with possibilities). I realized that I had to change my mindset and learn to remove filters. This is really useful as it helps to think out of the box and not put restrictions on my mindset. I am starting to apply this slowly. For me as I m very process driven and due to my discipline as an accountant and auditor, I am trying to remove filters and start every day with a “blank board” filled with possibilities. The second thing which I learnt was to communicate in a thinking manner rather than behavioural one. For example, in discussions with peers when commenting on ideas, I will try to understand their point of view and also compare from my point of view. Rather than saying, “That’s impossible and cannot be done or that person cannot do it”, I would say, “It’s a valid point, how about this idea?” From this particular angle, there may be possibilities. The third thing which I learnt was that innovation does not necessary come from people who are academically sound. The fourth thing which I realized was the difference between interpersonal and intrapersonal skills, and how crucial they are to the emotional intelligence aspect. This I have yet to master. I will try by reading some of the books Ravi recommended, and other books. The other thing I learnt is that innovation comes by not giving up but persistently trying and looking for different approaches. Sometimes, this may require me to change my routine, to try to change approach of doing things. Sometimes, we have to be bold and do things differently. That’s why I’m sharing my feedback with the participants and hope that you have learnt as much as I have from Ravi and that you will be motivated to innovate. The programme turned out way beyond my expectations. It hit me with thoughts that made me question our routine and common practices. The activities inspired me to think deeper into questions, issues or concerns, and to solve them through innovation and new ideas. Doing the same thing and expecting different results are just a sheer waste of effort and time. I choose not to rate this programme according to the common scale (very poor, poor, average, good or very good), but rather according to a journey that led me to be different from the norm. The content and facilitation of this programme provided diversity and opportunity for creativity and innovation to take place. Overall, I have benefited from this programme.